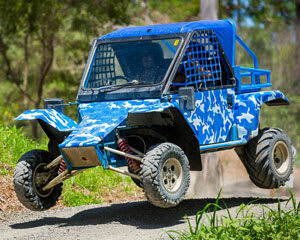 Take control of a unique "Tomcar" buggy for some extreme fun on our purpose-built track! You drive over jumps, through tunnels, water obstacles and lots more! Start Your Engines! 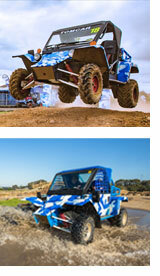 The Wildest Off-Road Adventure Park is here. Fun for the whole family! Wild Buggy experience is a thrilling drive for adults, whilst kids will LOVE this amazing driving experience in a dual-control Wild Buggy! Take control of a unique buggy for some extreme fun on our purpose-built track! Our 1km track you'll get to drive through 30+ obstacles that include water crossings, jumps, staircases, tyre obstacles, 45 degree walls, hills and more! Your session begins with a safety and instructional briefing and video before you head out to the cars. Now the fun begins! Take the wheel for a 10 minute drive and put the pedal to the metal - you can expect wild jumps and slides, mad hills and obstacles and all-round crazy buggy fun! Book now and hold on!